Several North American swallows construct their nests primarily of mud and this includes the cliff and barn swallows. The purple martin is a swallow and is different with some individuals using mud to create dams in front of their nests. However, many other martins do not build mud dams in their nests. 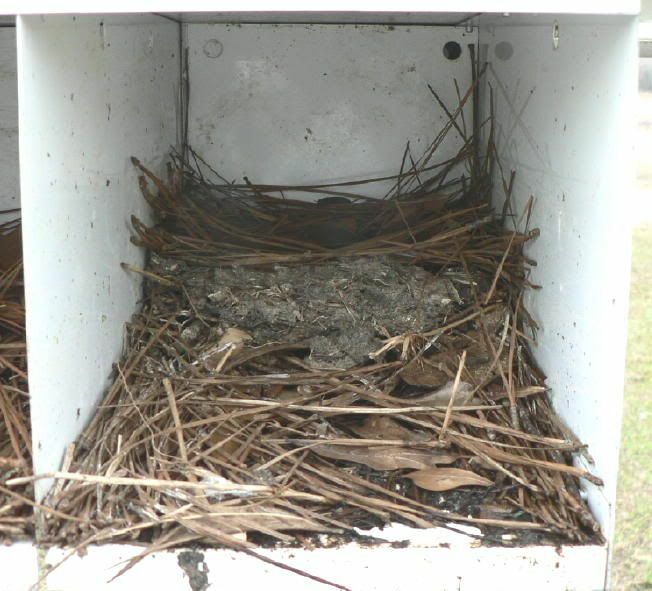 I have studied purple martin biology and behavior for over 40 years and have observed considerable variation in the use of mud by martins in my previous colonies in north Florida and my current site and satellite locations in northwest Louisiana. I have seen martin houses with cavities having well constructed mud dams and right next to one of these nests there will be another pair of martins with no mud in their nest. Some gourds have mud dams and most others do not and this includes commercial plastic ones and naturals. I see no difference in mud use by martins nesting in cavities with round holes versus those with srehs. Here are my observations and thoughts relative to the use of mud dams by purple martins in their nests. I am sure other folks have observed similar martin behaviors or perhaps different ones. Martins are individuals to a point though they behave in many similar ways due to common instinctive drives. A mud dam is an elevated barrier constructed by purple martins in front of their nests. The barrier may be solid mud or a combination of mud and plant material. The location of the dam can be at the entrance hole in small cavities such as the 6”x 6” size or farther back toward the middle in larger ones like 6” x 12”. Mud dams vary in height and width. I have seen a mud dam in front of a martin nest that was only about an inch or less in height and width. Other dams have been quite large to around three or more inches in height and two or more inches in thickness; these dams looked almost like barn swallow nests inside the martin cavity. Some dams are about as wide as the cavity while others may be only half as wide or less. Mud dams and using mud is not really the same thing though they may be related. Many martin nests may contain mud/dirt mixed in with the nesting material. However, this mixture is not a “formal” mud dam that creates an elevated barrier in the nest. Both male and female martins participate in nest building; however, from what I have observed, it is the female that actively builds a mud dam in her nest. Some females build elaborate large dams while others construct simple small structures. I have not observed any male martin collecting mud and then building a mud dam. I have often seen groups of female martins gathering around pools of water, ditches and wet areas to collect mud and mud/grass mixtures. The females peck at the ground and fill their beaks with mud. The females then fly to their nests to construct the mud dam while their mates may be nearby and provide protection from sexual attacks by other males. Additionally in my colonies, ASY females seem to be the primary mud dam builders and dam building activity is usually done during the main nesting time period. Late nesting ASY and SY females are not as prone to engage in mud dam construction possibly because of time constraints. Female martins are in charge of the nest relative to selection, egg laying/incubation, and brooding of the young. So the females are looking for the best and safest nest site for their family. Many martin houses/gourds have entrance holes cut low down relative to the cavity bottom and this provides easy access and direct line view into the nest. A predator can peer through the entrance into the nest cavity and perhaps see the martins inside. This can be an open invitation to predation and reduces the seclusion/privacy factor within the nest chamber. Also such nests provide little vertical height support for eggs/nestlings relative to the entrance hole. In such vertically shallow cavities martins may have more difficulty building substantial nests without the nesting material partially covering up the entrance hole. It is possible for eggs and small un-feathered babies to become displaced from the nest bowl during fighting between parents and other martins inside the cavity and be pushed or rolled out the bowl or even cavity entrance. Sometimes even a parent martin will inadvertently dislodge an egg/nestling from the nest bowl when he or she exits the cavity. And small nestlings will sometimes crawl from the nest bowl to near or at the entrance and become separated from their siblings. These un-feathered babies can die from body heat loss if their mother can’t brood them together with their siblings; males/females will not place these youngsters back in the nest bowl with the other babies. Now why would a mud dam provide safety for a martin nest? Mud dams possibly have a functional component relative to safety inside the nest, particularly with entrances cut low down and near the bottom of the nest cavity. The dam provides a barrier between the entrance hole and the actual nest bowl which contains the eggs/nestlings. Such a barrier may hide the contents from the watching eyes of owls and other avian predators, helps keep the eggs/nestlings together in the nest bowl and minimizes displacement, provides additional protection from the predators’ talons, and reduces rainwater intrusion. Also, a mud dam barrier can help to keep nesting material pulled together at the nest bowl, particularly in enlarged cavities. 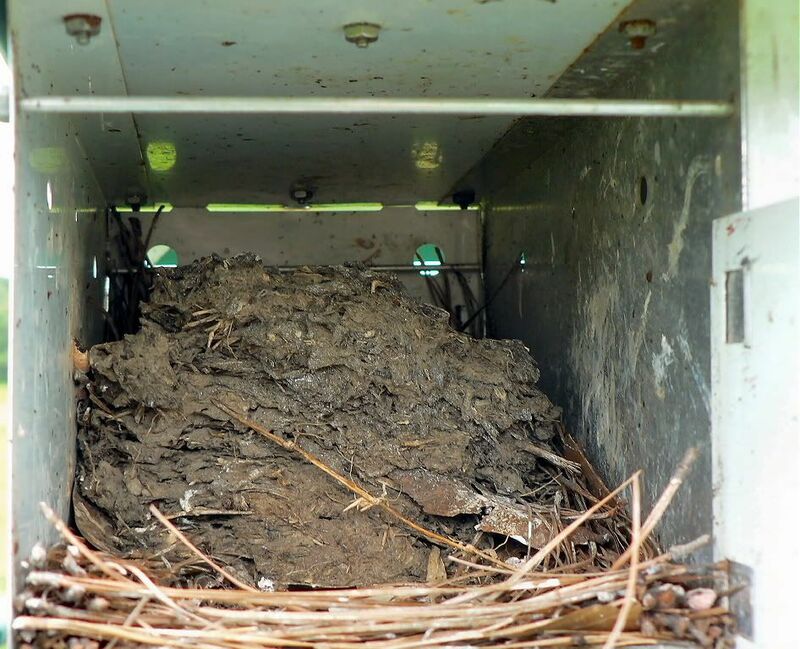 The mud dam functions similarly to a nest tray front border to help keep nesting material contained. Mud acts as a binding agent and the nesting material adheres to the mud dam. The martins can fill the area behind the mud dam with nesting material to create the nest bowl and the dam may help keep the nest intact. Even with the availability of a nearby mud source I have seen some female martins use mud and many others ignore it in my colonies. Why some martins build mud dams and others do not may be a mystery. Is the mud dam building behavior related to martin age, history of using mud, genetics, evolution or characteristics of the nest site? If mud dams have a safety component, then why don’t all female martins use them in their nests? Do female martins consistently use mud each season? Are females that build mud dams genetically pre-disposed to do so? Do all subspecies of martins build mud dams? I have more questions than possible answers to the variations of mud dam construction by female martins! Perhaps the simple reason is that female martins are more individualistic than we realize and mud dam construction behavior varies in expression throughout the species. Perhaps there is an evolving genetic connection with mud dam building behavior and some females have the gene while others do not. The mud dam construction behavior by female martins may be evolving in response to human made changes in cavity design/shape/size and entrance hole placement. And it would be interesting to band several female martins that build mud dams and several that do not. Then if these females return to the colony the next season, perhaps they could be observed to see if they continue the same behavior relative to building mud dams. I have used many types of martin cavities in my colonies and have observed some consistent mud dam building behavior relative to the cavity type and entrance hole placement. However, other martin landlords may have seen different mud dam building behaviors. Mud dams may help to hide the martins inside a cavity, provide a protection barrier in front of the nest to keep eggs/nestlings together, minimize rainwater intrusion and assist in keeping nesting material contained in the nest bowl. Therefore, the design/shape/size of a nest cavity and entrance hole location may influence the female martin’s decision to construct a mud dam. Cavities with entrance holes placed in such ways that minimize visibility and access to the nest contents may be viewed by female martins as safer for their eggs/young. Below I further discuss a possible connection between cavity design/shape/size and entrance hole placement and female martins’ propensity to construct mud dams. I have used many different kinds of martin houses and gourds in colonies in north Florida and now in northwest Louisiana. This includes commercial aluminum houses, homemade wooden boxes, natural gourds, and several kinds of commercial plastic gourds. Generally what I have seen is that females nesting in certain styles of multi-compartment houses seem to have a greater tendency to construct mud dams than females in various gourds. Most of the houses had/have entrance holes cut close to the compartment bottoms while there has been much greater variability in entrance hole placement depth in my gourds. Entrance holes cut lower down may allow more visibility/access inside the nest while entrances placed higher up do not. For thousands of years martins nested in vertically deep woodpecker cavities and still do out west. These are excellent nest sites and have served the purple martin and other cavity nesting birds well for eons. In these cavities the entrance hole is placed high above the bottom and the martin’s nest is deep down inside without direct line view from the outside. Also, woodpecker cavities are relatively small in diameter and easily cradle the eggs/nestlings within a restricted nest bowl; there is almost no chance that eggs/nestlings can become separated from the clutch/brood in such a cavity. This greatly reduces the chances of eggs “rolling out of the bowl” or small nestlings becoming separated from each other inside such a nesting space. It is important that eggs/small un-feathered nestlings stay close together so that the female can incubate and brood. So perhaps mud dams are not necessary in vertically deep cavities since the nest contents are largely hidden from outside view because of the depth. Additionally, there is no need for a dam to keep eggs/nestlings in place since the dimensions of the cavity are smaller and the nest contents stay largely together. Therefore female martins may instinctively refrain from using mud in vertically deep cavities. I have used vertically deep martin cavities in natural gourds and in single unit wooden boxes since the mid-60s and I have never seen a mud dam in them. These cavities may have entrance holes cut anywhere from six to ten inches above the bottom. Again, the shape and depth of these cavities may preclude a need by female martins to hide the contents from the entrance hole and the eggs/nestlings tend to remain together in the nest bowl. In horizontally deep compartments such as those of T-14s, Lone Stars, and modified Trio M-12s, martins can build their nests far away from the entrance hole. These compartments are typically 6” x 12” or larger in size. However, such deep compartments still may have direct line view into the nest cavities and the entrance holes are usually cut low down near the bottom. Females may still construct mud dams in such compartments and these dams are often deeper inside the cavity and not near the entrance hole. Every mud dam I have seen in horizontally deep compartments tends to be deeper inside and some almost create a double nesting chamber. Martins enter the compartment into an open “foyer” area and then go over a mud dam to reach the nest bowl. As mentioned before, the mud dam helps to contain the egg/nestlings together in the nest bowl within the enlarged cavity. Many martin houses still use the horizontally shallow 6” x 6” compartments with entrances cut one inch above the floors. Martins can successfully nest in these houses and I “raised” probably hundreds of young in them back in the 60s, 70s and early 80s. I no longer use such cavities in my martin colonies since such cavities can become slaughter pits when owls and hawks attack the martins inside their nests. The martins and their young are easily seen and reached by avian predators unless appropriate outside barriers are installed on the houses and even these guards may not work well with small cavities. When I used the 6” x 6” cavities with entrance holes cut about one inch above the compartment bottoms, I did see some female martins construct small mud dams at the entrance holes or just in back of them to possibly block view inside the nests. These mud dams were insignificant structures when compared to the huge dams I see in horizontally deep cavities which are much larger in size. The small 6” x 6” dimensions don’t provide much room for an elaborate mud dam so the females mainly appear to reduce visibility inside the cavities from the entrance hole. I have used Trendsetter and Sunset Inn aluminum houses with their offset holes, enlarged compartments and nest trays for several years. I have also used horizontal natural gourds with offset cut entrance holes in the necks. In all these cavities the martins enter and the hang a sharp turn to reach the nesting chamber which can be over 12 inches away, particularly in large horizontal gourds. So far I have not seen any mud dams constructed in the gourd cavities and very limited mud use in the houses. I have seen one or two examples of small mud dams constructed at the edge of nest bowls in the trays. These cavities do not allow direct line view into the nesting chamber and the martins are housed in a secluded area. Perhaps most female martins have no need to hide their nests in such cavities with mud dams. I have used multi-compartment Trio houses with double nesting chambers for many years and female martins infrequently build mud dams in them. In these houses, there is an open foyer area for one compartment and then the actual nest site is the other one with an internal access hole. The nesting compartment is off to the side and does not have a direct line view from the external entrance hole. Such cavities are secluded and provide considerable privacy and protection for martins in the isolated nesting compartment. However, I have seen several small mud dams constructed at the external or internal entrance or just inside them in a few cases. Why these females chose to build mud dams I have no idea. In these situations, the external and internal entrance holes are placed near the compartment bottom and this may have influenced the female’s decision. On my current Trio castle with double nesting chambers I have cut square shaped internal entrances about three inches high from the compartment bottoms to create more vertical depth. Bob has several Trio castles with the same internal entrance hole placement. So far no females have built mud dams in these double chambered nest sites. The vertically deeper nesting compartment may provide more security for the females. I have used natural and plastic gourds with PVC tunnels attached to the entrances and Troyer Horizontals with their tunneled foyer entrance area or with an added tunnel for a number of years. I have also used natural gourds with entrances cut at the ends of the necks to create a funnel approach to the nesting chamber. So far, I have not seen mud dam building activities in such cavities. Why? Perhaps the tunneled entrance area creates sufficient seclusion to alleviate any possible concerns a female martin would have in protecting her nest with an additional barrier such as a mud dam. A tunnel or funnel restricts visibility and access to the nest chamber from the outside and establishes a safe nesting environment for the martins. I have rarely used nest trays in my various multi-compartment martin houses. Currently I am using nest trays in my Trendsetters and Sunset Inns, but have only done so for several years. As mentioned earlier, several female martins constructed tiny mud dams at the edge of nest bowls. Since these houses use offset holes, perhaps this may have influenced females not to build substantial mud dams in their nests. I have spoken with other landlords who use nest trays and some female martins have constructed mud dams in cavities with the trays, including huge ones. It would be interesting to determine if these cavities have entrance holes that allow direct line viewing into the nesting chamber or have offset holes. I have seen comments from some sreh users that martins try to diminish the size of round holes by using mud and this is a reason for mud dams. This is definitely not true in my personal colony and colonies I have studied that use srehs. Some of the biggest mud dams I have seen have been in large T-14 compartments with crescent entrances. In fact, these huge dams looked like barn swallow nests. I have also seen mud dams in enlarged compartments with round holes. In cases I have observed, the mud dam is not placed at or near the entrance but farther back possibly because of the shallow vertical depth of the enlarged cavity. The entrance hole is cut close to the floor or even flush with it and this provides direct line visibility inside the nest and exposes the contents to possible dangers such as predators or heavy rainwater inflow. Perhaps some female martins view such low placement of entrance holes as dangerous and try to block view inside the nest with mud dams. Also the low vertical depth may create more chances for the eggs/small nestlings to become displaced and roll out of the nest bowl/entrance when females exit or if fights occur in the nest bowl between the parents and intruding martins, particularly SY males. The mud dam would help to mitigate the problems mentioned above by functioning as a barrier at the front edge of the nest bowl to keep the eggs/nestlings and nesting material together. As mentioned earlier, female martins will build small mud dams in 6” x 6” size house compartments with entrances cut low down. These dams tend to be constructed at the entrance hole or just in front of it because of the limited space inside the cavity. I don’t think the purpose of the dam is to make any entrance hole smaller but to restrict visibility and access to the nest. I build well constructed pre-nests of pine needles and dry oak leaves in all my martin cavities. So the only additional nesting material the martins usually add are more leaves. Martins love leaves, particularly oak, and fill the nest bowls with them. However, some females will still construct mud dams in certain cavities and pre-nests have no impact on this. The presence or absence of nesting material in a cavity seems to have little effect on a female martin’s decision to build a mud dam. Though most mud dams in my colonies have been constructed in house compartments and fewer in gourds, in 2009 I saw two unusual dams in my Excluder Gourds. The Excluder Gourds uses external and internal porches. I erected 36 new Excluder Gourds in 2009 and 32 were occupied. I built thick pre-nests composed of pine needles with oak leaves in the bowl in all these gourds and the only nesting material the martins needed to add was more leaves. In two of the gourds, the females built mud dams just inside the gourd and on top of the internal porch to possibly block visibility inside the nest and restrict access. The dams were a little over two inches wide and tall and partially covered up the internal porch. The martins entered their gourd and climbed over/went around the dam to reach the nesting area. No other female martins built mud dams in the Excluder Gourds. Here are the major conclusions I have drawn from observing mud dam construction behavior by purple martins in my various colonies for more than 40 years. (1) From what I have observed over the years relative to mud dams in purple martin nests, it appears that female martins build mud dams and the males do not participate. Female martins are individualistic in their mud dam construction behavior and you may see much variation in this behavior in martin colonies. Some females build dams and most others do not. Some females construct large mud dams while others build small ones. (2) I have seen mainly ASY female martins construct mud dams during the primary nest building time frame of my geographical area. I have not observed many later nesting ASY and SY females engage in mud dam construction behavior possibly because of time constraints late in the breeding season. (3) Mud dams can be constructed in all kinds of martin housing including wooden and metal houses and natural and plastic gourds. I have usually seen more mud dams in houses than gourds. (5) Vertically deep cavities with entrances cut high up that I have used for years have never have mud dams; possibly the entrance hole placement keeps predators from seeing the martins hunkered down inside their nests. Female martins may feel more protected in such cavities and not build mud dams to obscure their nests. Plus eggs/un-feathered nestlings tend stay intact in the nest bowl and there is little chance for them to be pushed out the entrance hole. (6) I have used horizontally deep house compartments with holes placed lower down toward the cavity bottom for a number of years and females have built mud dams in them including huge ones. These cavities have direct line visibility through the entrance hole to the back of the nest. Some female martins may construct mud dams about half way inside the cavity in front of their nest bowl to possibly hide and protect the contents. (7) I have seen limited mud dam building activity in horizontal cavities with offset holes in houses and gourds and in double chambered nesting compartments. Both these cavity types allow female martins to construct their nests largely out of view from the entrance hole. (8) In my colonies, gourds with tunnel like entrance areas have not had mud dams. Tunnel like entrances restrict visibility and access to the nesting chamber from the outside. (9) I have seen no difference in mud dam use between cavities with round holes and those with srehs. The shape of the hole has little to do with the ability of predators to see inside the cavity and I see no evidence that martins try to reduce the size of a round hole with a mud dam. Some of the largest mud dams I have seen have been in horizontally deep cavities with crescent entrances. (10) Female martins may build mud dams in cavities with or without well made pre-nests. (11) Female martins may construct mud dams in their nests for several reasons: hide and protect their eggs/young; keep eggs/small nestlings together via an elevated barrier at the nest bowl; help hold nesting material in the bowl; and minimize rainwater intrusion into the nest. (12) Perhaps in the future we will see more female martins building mud dams in martin houses/gourds. Martins continue to evolve and adapt to changes in their environment including their nest cavities. The mud dam construction behavior by female martins may be slowly evolving in response to human made changes in cavity design/shape/size and entrance hole placement. This is fascinating stuff and only time will tell if more and more female martins will become mud dam builders! This was a huge mud dam in an enlarged Trio compartment. The compartment is 6” x 12” and the dam was built about five inches from the entrance hole in front of the nest bowl. The dam was around four inches in height and about two inches thick and almost created a double nesting chamber. The martins entered at the top opening of the dam and dropped down into the nesting chamber. Eggs and nestlings were well concealed and protected in such a location and nothing could see through or over the high mud dam wall. No egg or small nestling could be displaced and pushed to the front of the cavity. The dam kept everything together in the nesting chamber and all the young fledged successfully. In the same Trio house there were no mud dams in other nests on the same side of the house as this nest in the photo. This was a small mud dam in front of the nest area and was located about six inches inside the 6” x 12” compartment of one of my Lone Star Goliad houses. The mud dam was somewhat like a nest tray in that it functioned as a barrier in front of the eggs/nestlings. Interesting topic and I am sure you will receive many responses from landlords providing information about their individual colonies regarding either the construction or non-construction of mud dams. At my colony, I use three different metal houses and all of them have divided nesting compartments; meaning the entrance into a foyer and then a left or right turn through a second hole to get to the nesting chamber. I use 36 Troyer horizontal tunneled gourds at my site. All housing is equipped with SREH openings. I have never had a mud dam constructed in any of my housing since I started hosting martins. Thanks for sharing your observations regarding mud dams. You use tunneled Troyer gourds and house compartments with divided nests and you don't see mud dams in them. I use tunneled Troyer gourds and have never seen a dam in them and nearly all of my double nesting compartments have none either. So we are seeing similar mud dam building behavior as a function of the type of nesting cavity. However, purple martins can surprise their human landords! Martins are individualistic and unpredictable at times. Perhaps in 2010 we will see mud dams in our tunneled and double nesting chambered compartments. I wonder how many folks had mud dams in their martin nests this season? This season I have not seen many and the few I have seen have not been large. Mud was available this season for the female martins to use, but only a few females used it. I am re-activating this older article dealing with mud dams in martin nests. I include two photos of mud dams, including a huge one in one of my houses. I had six nest built and I didn't see any mud dams at all. There was plenty of mud available but no dams built. There was a little mud but that was what came in with the corn fodder that was used to construct the nest. I had 2 mud dams this year. Both were small like in the second pic. One was in a house cavity, the other a gourd with SREH. Normally, I always get atleast one mud dam a season. When I started my colony with my wood house, a female made a large mud/stick dam as a SY female. The following year's, the same cavity always had a mud/stick dam in it built by a ASY female. I removed that house this year so I thought I would not get any, but did. Out of 66 pair this year I had NO mud dams. I usually have one or two that adds a little mud. It's amazing how, all things being equal (location, housing type, entrance type, compartment size, etc.) some of them build mud dams, and some decide not to. Steve K. wrote: The mud dam construction behavior by female martins may be evolving in response to human made changes in cavity design/shape/size and entrance hole placement. I think that is an excellent theory. I didn't have a mud dam in my pair's nest. I appreciate folks sharing their experiences with mud dams in their martin nests. It appears many female martins do not build dams and some do. Perhaps as we study this behavior more, we will gain a greater understanding of mud dam building by martins. I am still amazed at how some female martins build HUGE mud dams and right next to them will be other females that do build any kind of dam. Martins continue to surprise us and we learn new things about them every season. This year the water level in Ottawa River - where my site is located - was very low. The river banks were exposed ( usually there are big bolders along the banks) and there was lots of mud. My martins went crazy building fortresses from mud in most of the nests. So I think they are opportunistic. Maybe next year supply them with mud near your site and see what is going to happen. Your martins seem to have the mud dam building fever real bad! Your situation is most interesting. There was plenty of mud available and you indicated that most of your martins built dams in their nests. We had several wet areas around our colonies this season which had lots of mud. In the past, I have seen good numbers of female martins collect mud in these areas. But for some reason this season, the females did not use as much. Perhaps when the mud stimulus is "overwhelming", then this may trigger a massive response from the females to build dams. This could involve lakes, rivers (in your situation) and other significant bodies of water or swampy areas where mud is plentiful. Thanks for sharing your observation regarding mud dam building behavior by martins. Martin Colony History: The 1972 St. Agnes flood wiped out all the Martins in my area. One day, in 1997-98, 5 or 6 Martins landed on the power wires crossing my back yard. I had no house for them. They kept coming back day after day. We got a martin house a few weeks later & they have been coming back every year since. I average 12-15 pair per year. Half of my pairs had mud dams. One pair laid claim to house #2 & wouldn't let any other martins in it. They built 3 nests (all in a row) & all 3 had mud dams. Talk about over production, LOL. I have noticed that every pair that chooses a cavity facing either west or east ALWAYS uses mud & builds high dams. Most facing north or south do not, or don't use as much mud. My one pair built first a mud dam and then one without mud. As they were being harassed constantly by a neighbor and his friends early to late may have had something to do with the mud dam. They seemed to give up nesting for a while; the female became hesitant about coming in at night and would wait until after dark to join the male. They finally built a second nest where they raised their chicks. They fledged second week in July but all were lost at the same time on the same day. I want to get the VCR tape cleared of an ongoing conversation I was having so I can clearly hear what happeed with the fledgings and their friends accompaning them. The harassment had lessened probably because of the police who I complaied to when they built the second nest but had continued. A Fish and Wildlife representative returned a call stating that harassment was allowed but they could not kill the Martins, catch or sell them. The male martins in our two colonies are just beginning to collect dry oak leaves that I placed on the ground. Soon there will be more nest building activity. With all the rain we have had, there are areas with PLENTY of mud available! So I do wonder if some of the female martins will be active mud dam builders this year! I am re-posting this older article dealing with my observations/thoughts on mud dam building behavior by martins. AS OF TODAY I HAD 13 MATINS HERE IN CENTER VA.
Martin Colony History: Erected 1st house in 1997. Birds were checking it out before Mike got down from the ladder. Six cavities had a little colony 1st year. Grown to 88 cavities all gourds with near 100% occupancy. Most important factor for success is rain = bugs. Back when we had wooden housing with round holes, we used to see mud inside the cavities. Sometimes you could call it a dam; other times not so much. Edit: Those houses across the road also have big ole round holes - so maybe there's something to that as well.